Following the same chapter organization as An Introduction to America’s Music, To Stretch Our Ears is the first gathering of significant and far-reaching readings that illuminate many aspects of American music. Streaming access via StudySpace to over 80 music selections discussed in the book; the same recordings that are featured on the audio CD set. An ear-opening exploration of music’s New World, from Puritan psalmody to mash-ups. Richard Crawford and Larry Hamberlin show how the lively interactions between the folk, popular, and classical spheres have made American music resonate with audiences around the world. 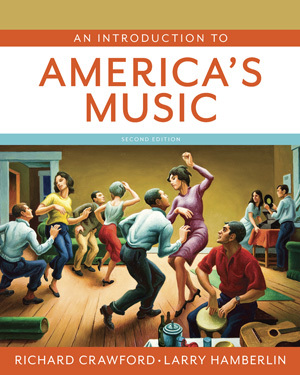 Students will learn how to listen critically to eighty-eight pieces in all the major styles and genres, while gaining a clearer understanding of music's role in the history of American society, business, and technology. The authors’ combined knowledge and expertise ensures comprehensive and balanced coverage. Both are masterful storytellers and argue that America’s music has been characterized by the lively interaction between the folk, classical, and popular spheres. The book is organized chronologically into four parts and covers all the major styles and genres of music. In this edition, the coverage of music since 1950 has been greatly expanded. In the Second Edition, an introductory unit on musical fundamentals teaches students how to listen and what to listen for. Each point is illustrated by examples drawn from pieces discussed in the book. Redesigned listening guides for eighty-eight individual works represent all the major styles and genres featured in the book. Each guide highlights the essential points of each piece with minute-by-minute descriptions. “What to Listen For” points spotlight the big ideas, and “Listen and Reflect” questions at the end of each guide encourage students to compare and contrast music from different periods and traditions. The Listening Package has been expanded and is now available as a four-CD set, or it can be streamed online. The Second Edition features a vivid new four-color design (with 200 photographs) and in-text features to guide and engage students—including sidebars that supplement the text and give a brief account of people, events, issues, and institutions. Time lines in each part set the events in cultural and historical context. From the opening vignette about Barack Obama’s inaugural concert—billed as “We Are One” and featuring a galaxy of rock stars, soul singers, rap artists, country crooners, gospel choirs, and a symphony orchestra—the text shows that there never has been one dominant musical culture or mainstream in American history. Each chapter brings together a diverse range of music and draws out common, unifying themes. The text embraces the study of how people use music: how music functions socially and culturally, how it sets the tone for ritual events, and how it is passed on from generation to generation. And the book delves into the sounds of music and how they operate to create musical meaning.